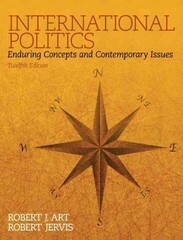 International Politics 12 Edition Places contemporary essays alongside classics to survey the field’s diverse voices, concepts, and issues Challenging students to use original scholarship to recognize and analyze patterns in world politics, this bestselling reader considers how to effectively understand politics under governments and beyond. Carefully edited selections cover the most essential topics and are put into conversation with each other to illustrate fundamental debates and differing points of view. Comprehensive and engaging, International Politics offers the best overview of the discipline as well as the forces shaping the world today. ALERT: Before you purchase, check with your instructor or review your course syllabus to ensure that you select the correct ISBN. Several versions of Pearson's MyLab & Mastering products exist for each title, including customized versions for individual schools, and registrations are not transferable. In addition, you may need a CourseID, provided by your instructor, to register for and use Pearson's MyLab & Mastering products. Packages Access codes for Pearson's MyLab & Mastering products may not be included when purchasing or renting from companies other than Pearson; check with the seller before completing your purchase. Used or rental books If you rent or purchase a used book with an access code, the access code may have been redeemed previously and you may have to purchase a new access code. Access codes Access codes that are purchased from sellers other than Pearson carry a higher risk of being either the wrong ISBN or a previously redeemed code. Check with the seller prior to purchase.